The MCP1406/07 devices are a family of buffers/MOSFET drivers that feature a single-output with 6A peak drive current capability, low shoot-through current, matched rise/fall times and propagation delay times. These devices are pin-compatible and are improved versions of the TC4420/TC4429 MOSFET drivers. The MCP1406/07 MOSFET drivers can easily charge and discharge 2500 pF gate capacitance in under 20 ns, provide low enough impedances (in both the ON and OFF states) to ensure that intended state of the MOSFETs will not be affected, even by large transients. 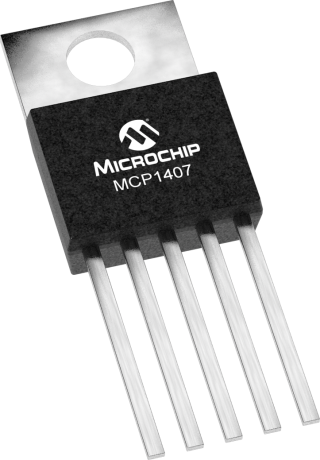 The input to the MCP1406/07 may be driven directly from either TTL or CMOS (3V to 18V). These devices are highly latch-up resistant under any conditions that fall within their power and voltage ratings. They are not subject to damage when up to 5V of noise spiking (of either polarity) occurs on the ground pin. All terminals are fully protected against electrostatic discharge (ESD), up to 2.0 kV (HBM) and 400V (MM). The MCP1406/07 single-output 6A MOSFET driver family is offered in both surface-mount and pin-through-hole packages with a -40°C to +125°C temperature rating, making it useful in any wide temperature range application.